The Volkswagen Golf is one of the best-known cars on the road today. For decades, the Golf has been a fuel efficient, reliable car. We’re happy to say nothing has changed for 2018; the Golf is still fuel efficient and reliable, and VW made sure it’s also stylish, practical, and ready to perform. We have a Golf model to meet your needs, so read along and find out what Golf model is right for your lifestyle. The Golf Family is a big one. For 2018, the VW Golf lineup includes a range of models that meet the needs of all types of Canadians. Whether you’re looking for an affordable daily driver, a spacious wagon for the family, or a sporty, performance-focused hatchback, there is a Golf model that’s right for you. 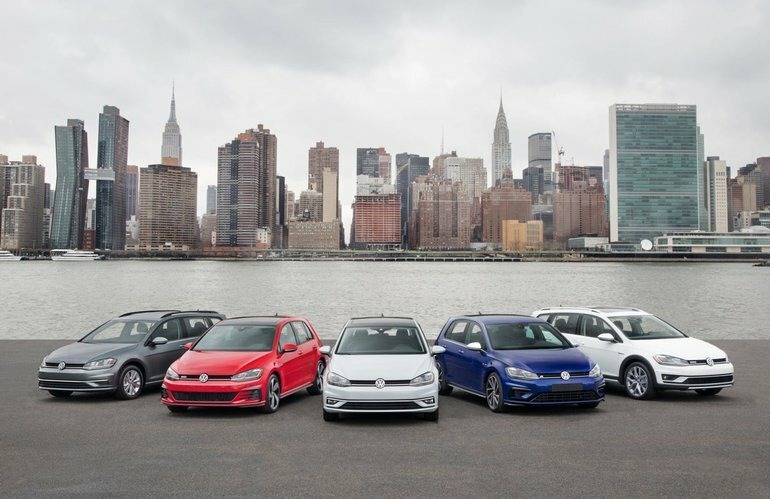 Along with the standard hatchback version of the Golf, the rest of the family includes the Golf Sportwagen, Golf Alltrack, Golf GTI, and Golf R.
VW was able to improve on the already impressive 2017 Golf lineup by focusing on the little details. Along with new wheels for 2018, all new Golf models now come with LED tail lights and running lights. The interior of the Golf keeps its simple and intuitive design, but a few key areas have been improved. The Golf now comes standard with a 6.5-inch (16.5 cm) touch screen, and some trim levels come with an even larger 8-inch (20 cm) screen. The biggest interior change is in the Golf R model where the new Digital Cockpit replaces the conventional instrument panel found on most vehicles. The 2018 VW Golf comes in a range of trim levels for you to choose from. If you’re looking for a truly comfortable car that drives like a dream, the 2018 Golf with the Comfortline trim is the car you’ve been looking for. It’s an ideal daily driver that is great on gas, and for 2018 has some impressive upgrades, including a sunroof as a standard feature. The Comfortline also allows you to add the optional Driver’s Assistance Package which provides you with features that can help make your driving life a lot easier and safer. For a bit more flash and audio might, VW offers the Highline trim that includes the Light and Sound Package, 18-inch wheels, and the Technology Package which includes adaptive cruise control, lane assist, park assist, and other important features. Yes, the Golf Family has something for just about everyone. Shop our selection of 2018 VWs today and find the Golf that’s right for you.